Showing 52 articles from November 8, 2017. LOUISBURG -- Residents in Franklin County's four municipalities decided that they liked how things were going -- keeping every incumbent in office. But, they also got to sprinkle in some new faces as political newcomers in Louisburg and Franklinton will join their respective governing boards following Tuesday night's election. 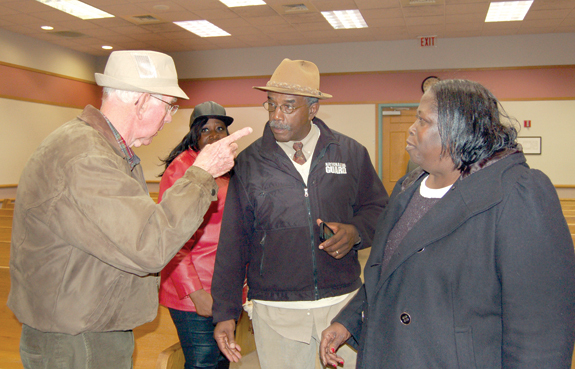 The Louisburg mayor's race offered the most intrigue, as incumbent Karl Pernell faced a challenge from Councilman Christopher Neal. 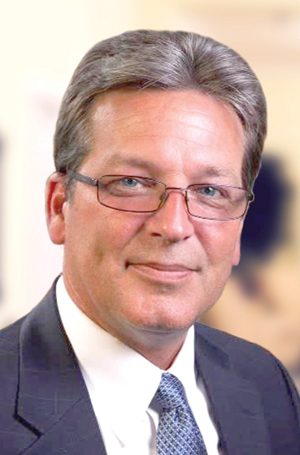 LOUISBURG -- Louisburg College's next president will be trading a view of Lake Erie for the banks of the Tar River, but his experience should be eerily familiar -- and a bit different. Leaders at the private, two-year residential college in Franklin County tabbed Dr. Gary M. Brown as its new president, becoming the 28th leader at the institution, related by faith to the United Methodist Church. 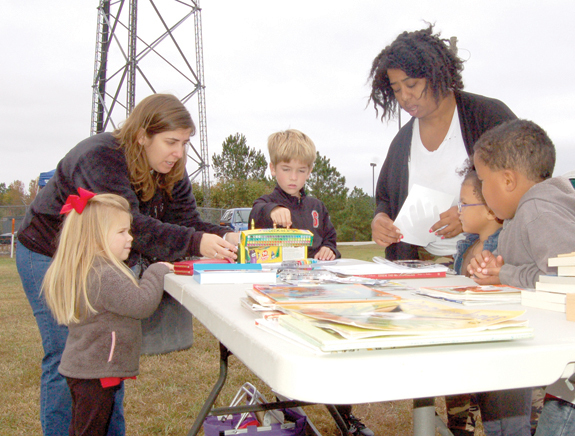 From left, Paige, Kim and Parker Almkuist, Benita Edgerton, Macaila and Devon Whitted have fun with arts and crafts set up during the unity day in Bunn. BUNN -- When he watched the news, Blaise Harris saw hatred, division and anger tearing at the seams of communities across the country. What he wanted to make certain was that he didn't see those things in Bunn. So, with the help of friends, he set out to start a dialogue about race and class that he hopes will build a bridge between divergent communities -- fostering understanding and friendships that don't allow differences to fester in the dark until they light a spark that can destroy a community. YOUNGSVILLE -- A nondescript building tucked away in Franklin County's industrial area on U.S. 1 was empty and quiet a day after federal agents raided the call center and consulting company on Tuesday. Agents with the U.S. Department of Homeland Security checked in with the Franklin County Sheriff's Office as they executed a search warrant at the building, located at Flex Way -- a short, dead-end drive next to and behind Xerium Technologies on Capital Boulevard. YOUNGSVILLE -- Franklin County's law enforcement and emergency management community scheduled a multi-agency, multi-county live shooter training exercise long before a gunman opened fire at a Texas church, killing 26 people. That Sutherland Springs, Texas massacre, sadly, though, highlights the need for such training, authorities say. Is it any wonder turkeys are suddenly nervous? Greetings ... and a bit of a warning. Can you believe Thanksgiving is just two short (very short) weeks away? 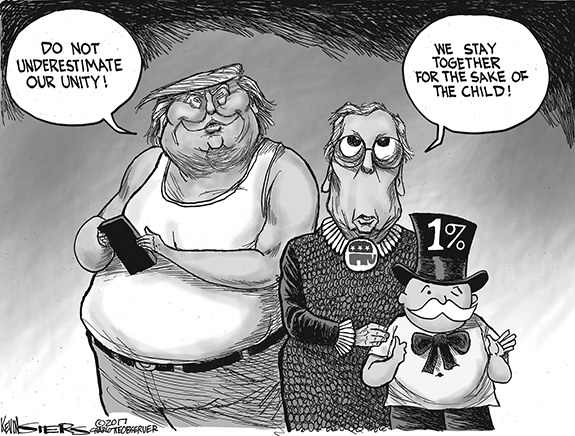 It hardly seems possible, especially since we're already behind at our house. In years past, Nick and I have "demanded" a Thanksgiving "practice" dinner cooked in October -- as if Donna needs any practice. Nick and I, however, are more than happy to practice eating. Is Congress catching on to social media threat? Dare we hope that North Carolina's senior senator is finally beginning to get it? 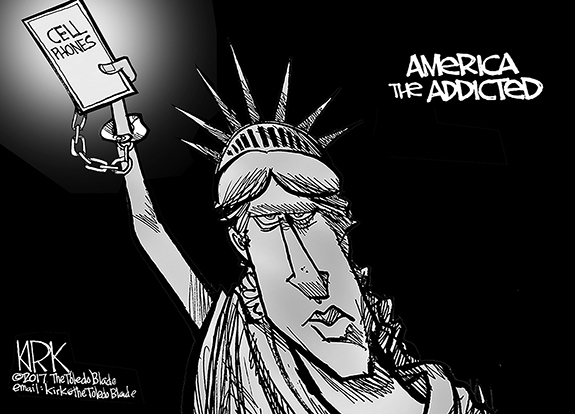 Could it be that he and his colleagues in Washington are realizing that social media campaigns financed, directed and created by foreign nationals are a huge threat to this nation and the American way of life? It seems you can't go very far around Franklin County without getting tangled up in an Internet access or broadband date transmission discussion. As recently as last month -- and for the past few months, for that matter -- a group of industrious residents and those with interests in northeastern Franklin County have been talking about ways to improve the quality of life and economic prospects for those who live in a self-described oft-forgotten area of Franklin County. Dear editor: I don't always have the time to read your paper the same week it is delivered, but when I finally had the chance to read Mr. Cunard's editorial from October 19 ("Stealth Ads, secret money are real threats to U.S."), I had to write my first letter to the editor of this newspaper. RALEIGH--Dorothy Marie (Battles) Ward, 85, passed into glory on Tuesday, October 31, 2017, in Raleigh, N.C. Dorothy was born March 31, 1932, to Walter and Emma Battles in Pittsburgh, Pa.
LOUISBURG--Funeral services for Edith Mae Thomas, age 74, who died on Monday, Nov. 6, 2017, will be held Saturday, Nov. 11, at 12 noon in the Richardson Funeral Home Chapel in Louisburg. Burial will follow in the Haywood Church Cemetery. BROOKLYN, NY-- Funeral services for Gwendolyn D. Woods, 71, of Brooklyn, N. Y., formerly of Louisburg, who died Wednesday, Nov. 1, 2017, will be held Sunday, Nov. 12, at 1 p.m. in the Richardson Funeral Home Chapel in Louisburg. Burial will follow in the Old Phelps cemetery. FRANKLINTON--Janie Marie Fortys Hudson, 63, died Saturday, Nov. 4, 2017 at her home. A memorial service will be held Friday, Nov. 10, at 6:30 pm at Franklinton Baptist Church, with the Reverend David Averette officiating. 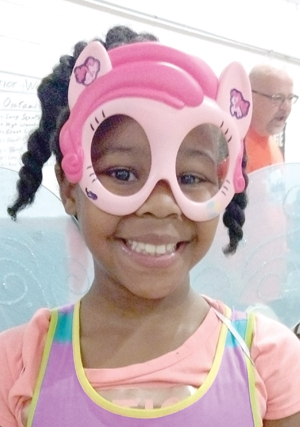 Following the service the family will receive friends at the home, 2053 Flint Rock Road, Franklinton. LOUISBURG - Judy Pullen Morgan, 62, of Louisburg, passed away Wednesday morning. LOUISBURG­--Funeral services for Thomas "Buckeye" Terrell, 54, who died Tuesday, Nov. 7, 2017, will be held Monday, Nov. 13, at 1 p.m. at South Main Street Baptist Church in Louisburg, with the Rev. Dr. David Rosby officiating. Burial will follow in the M. H. Jones cemetery. OXFORD--Virginia Pleasants Newton, 84, died on Monday, November 6, 2017 at UNC Memorial Hospital. 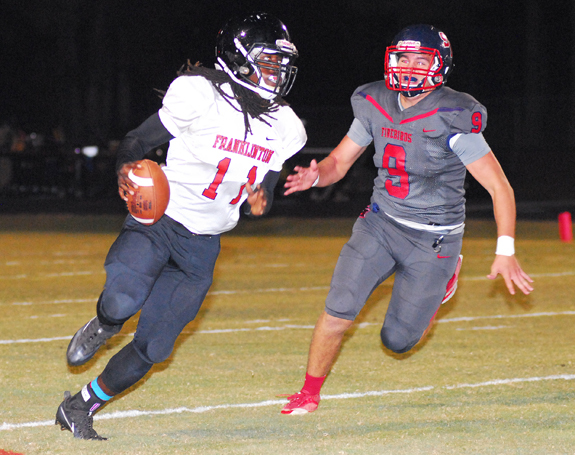 Franklinton HS quarterback Kyeon Spencer (left) picks up yardage as Southern Nash's Hunter Perry pursues during last Friday night's Big East Conference football matchup at SNHS' Firebird Stadium. Southern Nash put an exclamation point to a prolific Big East surge this season -- and clinched the league title outright for the second straight year -- with a convincing home victory last Friday at home against Big East newcomer Franklinton. 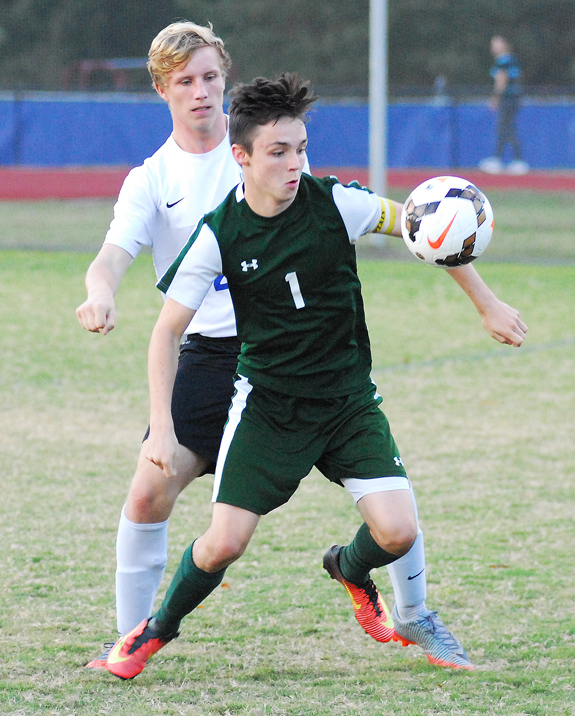 For the Bunn Wildcats, that was about the only way to describe last Wednesday's contest against host Durham School of Arts in the first round of the Class 2-A Boys Soccer State Playoffs. Several successful onsides kicks from Terrell Lane's Austin Robertson proved to be a key for the Tornadoes during Monday's home victory against Northern Granville. 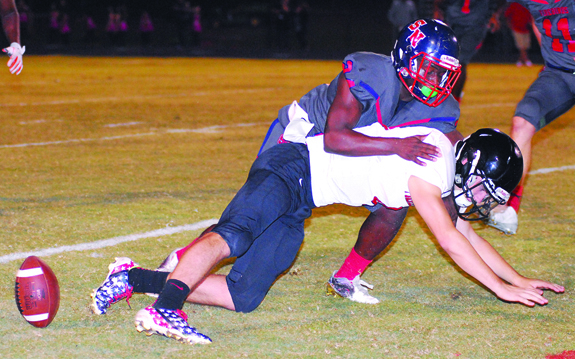 LOUISBURG -- Terrell Lane came up with a unique way to supplement an already-potent offense during Monday's football playoff contest against Middle Athletic Conference opponent Northern Granville. 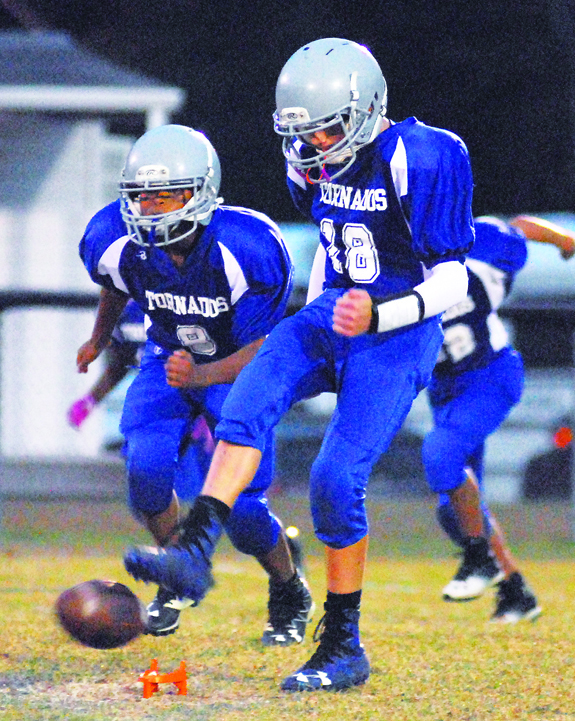 TLMS' Austin Robertson delivered a trio of successful onsides kicks in the first three periods alone as the Tornadoes stopped the Knights by a 46-28 total in a duel of No. 2 seeds in the league at Patterson Field on the campus of Louisburg High School. 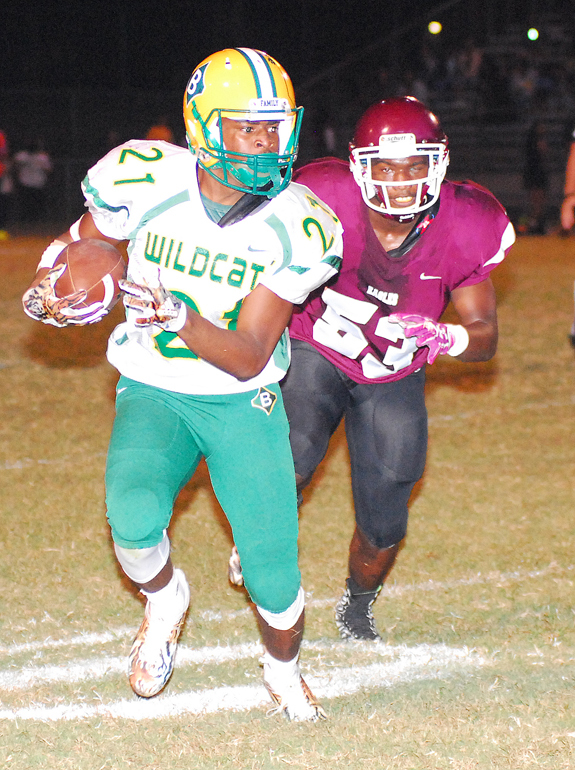 ROANOKE RAPIDS -- Bunn's mission was simple heading into last Friday's regular season football finale at Roanoke Rapids. STEM -- Several factors worked together as the Louisburg High School boys soccer squad got off to a slow start to the 2017 season. The Warriors had graduated several key performers from last year, and the squad was moving up to the split Class 1/2-A Northern Carolina Conference. 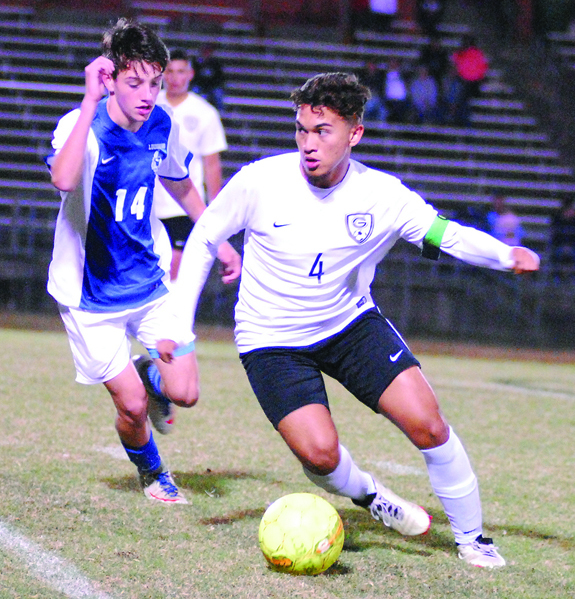 Throw in a handful of new players to go with a new coaching staff, including former LHS player and current head coach Braulio Rayo, and the Warriors dropped seven of their first eight matches. 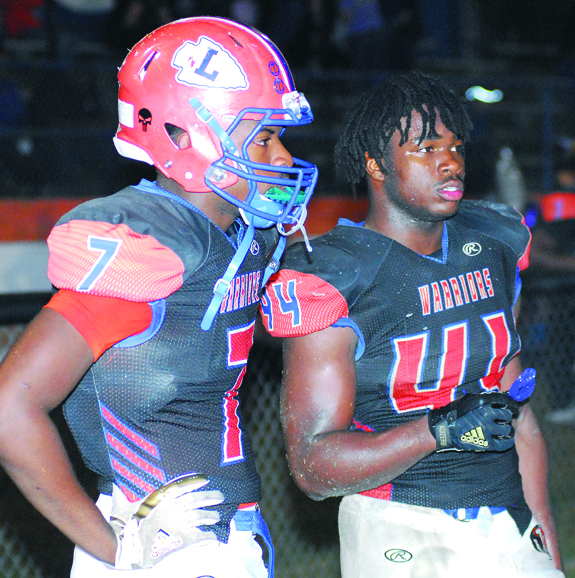 LOUISBURG -- Despite a nine-game losing streak, the Louisburg Warriors entered last Friday night's regular season football finale against rival Granville Central with playoff aspirations. 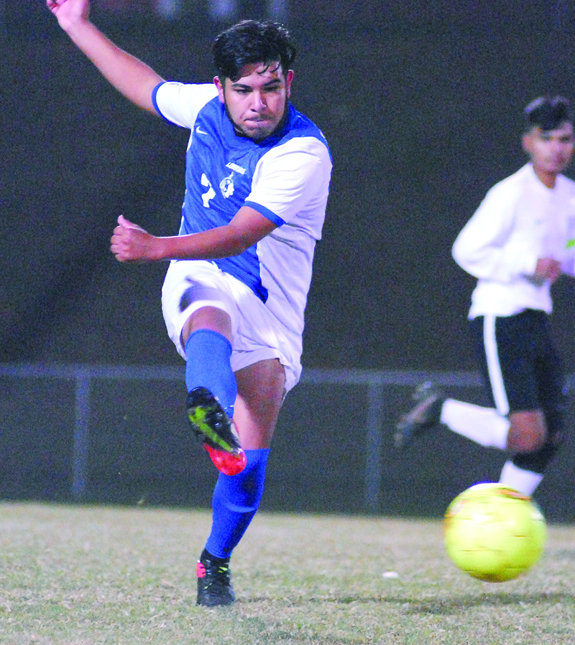 LOUISBURG -- After a brief one-year absence, the Louisburg College men's soccer team is making a return trip to the National Junior College Athletic Association National Tournament. Louisburg, the 2015 national title winner, punched its ticket last Saturday with a 3-1 home victory over Eastern Florida State. RALEIGH -- The 20th Annual Skate with the Canes event will take place on January 7 at PNC Arena in Raleigh from 1:30-4 p.m.. Doors will open at 12:30 p.m. This event is one of the most interactive, all-access, behind-the-scenes, player-friendly events that the Carolina Hurricanes organization offers each year. ZEBULON -- The Carolina Mudcats have announced their full baseball schedule for the upcoming 2018 Class A Carolina League season at Five County Stadium. The Mudcats open the new season at home on April 5 with Opening Night 2018 against the Winston-Salem Dash. The season-opening, seven-game homestand will feature four games versus the Dash before concluding with three games versus the Frederick Keys. CHAMPS. 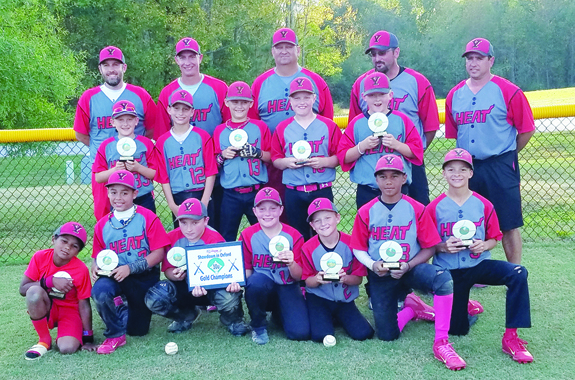 The Youngsville 10-Under Heat recently won the AAU Gold bracket at a baseball tourney in Oxford. The Heat went 4-0 at the event, including a 3-1 finals victory vs. North Wake Elite. 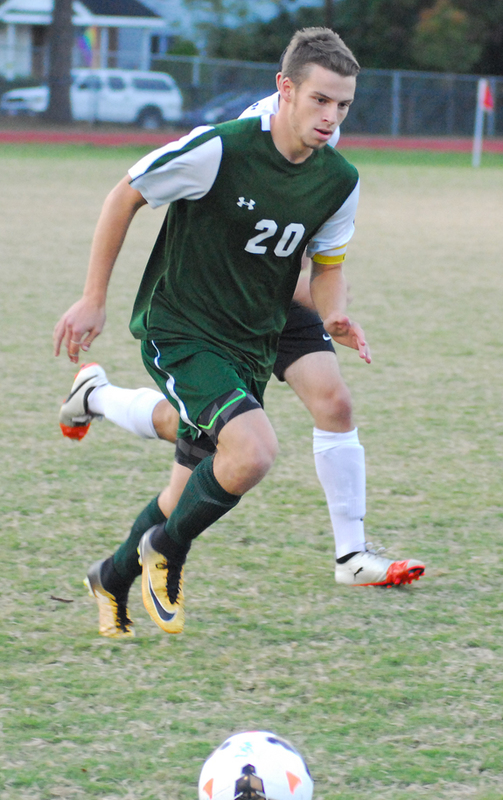 Bunn's John Stallings (left) advances the ball last Wednesday against Durham School of Arts. Franklinton's Scott Schriver (bottom) tries to bring in a pass reception while being defended by Southern Nash's Quinton Cooley during last Friday night's league football meeting. 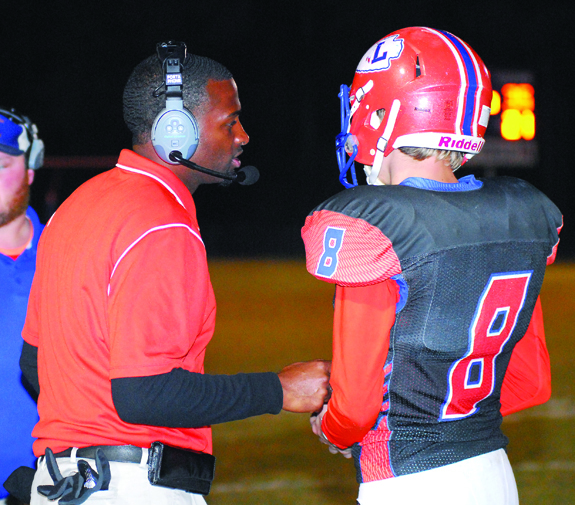 Louisburg High School coach Dontae Lassiter sends in a play with backup quarterback Thomas Joyner during last Friday night's football game. Granville Central's Ismael Quintanilla (right) tries to find an open teammate as Louisburg's John Allen Faulkner during last Saturday's match. 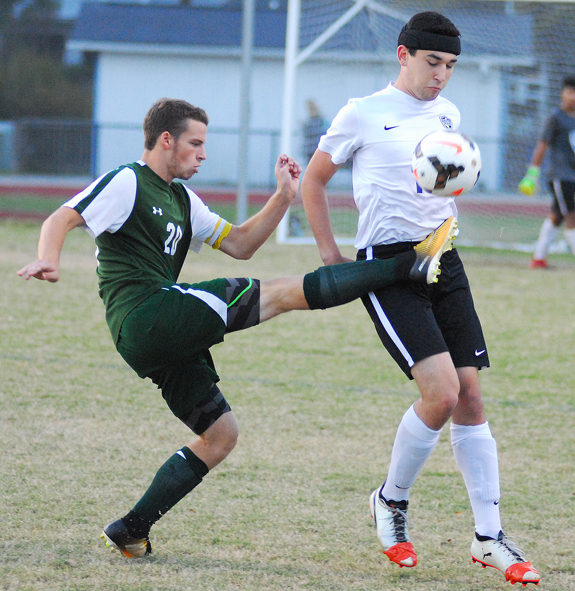 Bunn's Tanner Friedly shields a Durham School of Arts player from the ball during last Wednesday's first-round match in the Class 2-A Boys Soccer State Playoffs. Sharing the knowledge generated through research remains the goal of the North Carolina Cooperative Extension. N.C. Cooperative Extension has a long, proud tradition of serving the citizens and communities of North Carolina. Formally established in 1914, the Extension Service is a partnership of county, state and federal governments. Throughout its history, it has focused on providing people with learning opportunities that allow them to benefit from research-based knowledge. The Food and Agriculture Organization (FAO) of the United Nations predicts that by 2050 the world's population will be at 9.1 billion people. 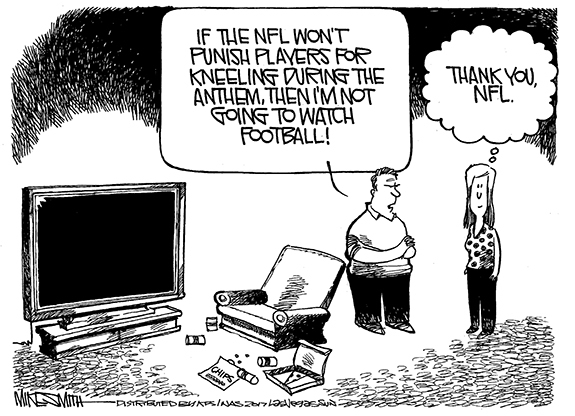 That`s a big increase from the 7.5 billion people that exist today. The FAO also predicts that we will have to increase our agricultural production rates by 70% in order to feed that population. In Franklin County, we have had our first "killing" frost. This is the time of year to be careful with several summer forage grasses, such as the sorghums. Pearl millet does not present a problem with prussic acid, however, it will accumulate nitrates in the same manner as the sorghums under stress conditions. It was discovered in the early 1900s that under certain conditions sorghums are capable of releasing hydrocyanic acid or commonly called prussic acid. Pulling up to the Farmers' Market shelter in the early morning brings to mind looking at the start of a painting. Lights flicker on and signs fold out. Each vendor has their favorite spot. One by one they start setting up and the shelter takes on their special signature. Crisp, leafy greens from the early morning harvest look like they are so fresh they are still growing. Franklin County Health Department encourages tobacco-free living during the American Cancer Society Great American Smokeout on Nov. 16, 2017. Franklin County Health Department is encouraging Franklin County residents to commit or recommit to healthy, tobacco-free lives by participating in the American Cancer Society Great American Smokeout on November 16, 2017. Area cattle producers are invited to participate in a "Beef Cattle Marketing Trends and Updates" discussion on Tuesday, Dec. 19, at the Franklin County Cooperative Extension Center Annex meeting room, in Louisburg. Dinner will be served at 6 p.m., followed by the educational and informative programs. Will Hargett, of East Carolina Stockyards is sponsoring the meal and also speaking on marketing trends and how to get the most from your calves in 2017. Franklin County 4-H'ers have been very busy gearing up for different events and competitions. Our most recent events and competitions include the NC State Fair and the Four County 4-H Poultry Show and Sale. One of our recent events that occurred in October was the NC State Fair. We had approximately forty 4-H'ers competing in various areas at the NC State Fair, mostly in the Livestock division. As the holiday season nears, you can begin to smell the wonderful aroma of baked goods; cakes, pies and breads just to name a few. The smell of freshly baked bread is an aroma like no other and the taste of a warm, freshly baked loaf of bread is oh so wonderful. Making a loaf of bread in the comfort of your own kitchen is more common than most people think and it's not as complicated as you may be thinking it is. Is that a yam or sweet 'tater? Have you ever wondered whether those are yams or sweet potatoes on your Thanksgiving plate, and just what is the difference between them? Well, if you're eating something moist, sweet, and just downright delicious, then you're probably feasting on a sweet potato. Sweet potatoes are root vegetables that are naturally sweet and most of the potatoes for consumption have orange-colored flesh. In the United States, all so-called "yams" are actually sweet potatoes. LOUISBURG -- For the first time in more than a dozen years, Franklin County Schools is doing a Classified Employee Salary Study to determine how what it is paying compares to similar positions in the region. Perhaps not surprisingly, the schools discovered that one of its top competitors for talent is Franklin County government, which is paying significantly higher salaries for some key positions. Kerr-Vance Academy in Henderson announced its first quarter honor roll. FRANKLINTON -- The State Highway Patrol responded to a wreck Saturday morning, charging an off-duty sheriff's deputy with driving under the influence. James Christopher Senter, 52, was charged with driving while impaired, failing to maintain lane control and having an expired registration. His license was also revoked for 30 days. Vance-Granville Community College held educational programs for students on all four of its campuses in recognition of October as Domestic Violence Awareness Month. 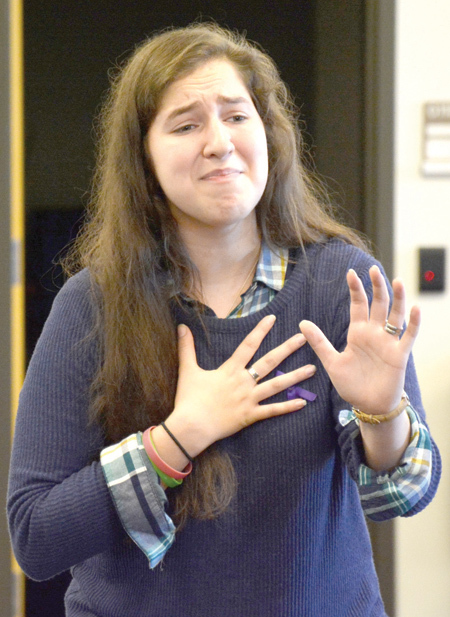 The series kicked off Oct. 16 at the college's Warren County Campus. LOUISBURG -- The complicated and controversial proposal to build a new stand-alone restroom for the Franklinton High School baseball and softball fields hit yet another hurdle Monday night when the school board saw the totals of the revised bids. This time around, the only complete bid for the project totaled $300,773 (with options) for the 725 square foot building -- making the cost about $415 per square foot. FRANKLINTON -- Science Magazine has recognized Novozymes as the world's second best employer in its 2017 Top Employers Survey. Accu Tech USA, the newest manufacturing facility in Youngsville, held their grand opening and ribbon cutting at their new location at 5240 Hwy 96, Suite 106, Youngsville, Monday, Oct. 30, along with the Greater Franklin County Chamber of Commerce. Accu Tech USA manufactures linear guides, ball screws and custom actuators.